Fun fact: with 320,000 horses in Kentucky, there&apos;s one equine for every 12 state residents. While you might know about Lexington&apos;s rich equine history and its reputation as the Horse Capital of the World, here are some things you probably didn&apos;t know about Lexington, Kentucky. 1. Limestone water produces great horses-and bourbon. Located in the center of Kentucky&apos;s Bluegrass Region, Lexington is widely known for ‘growing&apos; strong horses unlike anywhere else in the world, which many people attribute to limestone-infused water and soils that feed the grass in this renowned Horse Country. This is also Bourbon Country, where nine distilleries operate within 35 miles of downtown Lexington. Add a growing craft brewery scene, more than 100 locally owned restaurants-and even a Donut Trail-and you have all the ingredients for a truly memorable visit in this cool destination. 2. Man o&apos; War was born here. Lexington was the birthplace of the legendary, Man o&apos; War, long revered for his racing prowess, although this amazing equine never ran in the Kentucky Derby. Surrounded by more than 400 horse farms, Lexington is the undisputed Horse Capital of the World. More than 8,000 registered thoroughbred foals are born in the state annually. 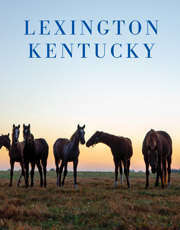 Horses are flown into Lexington each year from all over the world to live and breed at famous local horse farms. 3. Celebrities like to raise horses here. It&apos;s no wonder that many notable people own and operate horse farms in the the Horse Capital of the World, including William Shatner, Jerry Bruckheimer, Steve Zahn, J. Peterman (from "Seinfeld" fame) and Sam Shepard. 4. 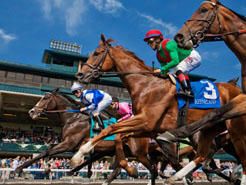 Lexington visitors can watch racehorses in training. Lexington&apos;s Thoroughbred Center houses approximately 1,000 horses at any one time that are training to become racehorses. You can take a tour and watch horses train at the Thoroughbred Center for around $15. You can join a group tour of several farms, customize your own visit with a private guide, or visit solo with advance arrangements. 5. Lexington features two race courses. Lexington&apos;s iconic Keeneland Race Course is a National Historic Landmark and Thoroughbred race course, offering race meets in the spring and the fall. Last October, Keeneland hosted the 2015 Breeders&apos; Cup World Championships, the most prestigious two days in Thoroughbred racing. More than 90,000 people attended the championships at Keeneland over the course of two days and Lexington was alive with concerts, exhibits, events and celebrations. Keeneland operates the world&apos;s largest Thoroughbred Auction House. People from across the globe attend the Keeneland September Yearling Sale each year, which is open to the public. The 2016 Kentucky Derby Winner, Nyquist, is a Keeneland September Yearling Sales Graduate. Lexington is also home to the Red Mile, the second oldest harness racing rack in the world. At the Red Mile entertainment complex you can enjoy live racing, simulcast racing, and Instant Racing machines. 6. Lexington has two horse museums. You can experience 50 million years of horse history at the International Museum of the Horse, a Smithsonian affiliate, while the American Saddlebred Museum honors Kentucky&apos;s oldest native breed. Both museums are located on the grounds of the Kentucky Horse Park. In downtown Lexington, Thoroughbred Park pays homage to the city&apos;s horse race tradition, with a series of grand, life-size bronze horse sculptures that depict the final moments of a race. 7. This is the best spot for equine health in the nation. The best equine care facilities in the world are located here, too. They include Rood & Riddle Equine Hospital (tours by appointment); Haygard, Equine Medical Institute, operating since 1876; the Gluck Equine Research Center at the University of Kentucky; and more than 16 individual clinics that specialize in horse health. 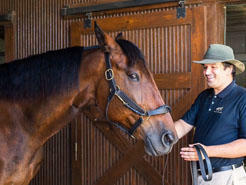 Old Friends at Dream Chase Farm in Lexington is one of the nation&apos;s best retirement homes for thoroughbreds. 8. Bourbon was born in Kentucky. Bourbon country is a big draw for visitors. Lexington is the self-proclaimed "Best Place in America to Grab a Drink"-with good reason. In the heart of Bourbon Country, Lexington is a hub for an ever-growing number of micro-distilleries, wineries, coffee shops and craft breweries, as well as renowned bourbon bars. It&apos;s also home to nine world-renowned bourbon distilleries that operate within 35 miles of downtown and right in the heart of Horse Country. Included on the Kentucky Bourbon Trail Craft Tour, Barrel House Distilling Co., operates on the site of the historic James Pepper Distillery. Lexington&apos;s Distillery District is home to an eclectic array of bars, restaurants, coffee shops, food trucks and distilleries. Just down the road is Town Branch Distillery, another stop on the trail. 9. Lexington has its own Brewgrass Trail. 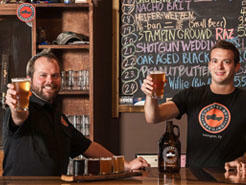 Lexington&apos;s Brewgrass Trail features the craft beer breweries in the city and surrounding counties. You can sample Country Boy Brewing&apos;s experimental brews, Belgian farmhouse and American craft beers at Ethereal Brewing, hard-to-find and locally sourced ingredients at Chase Brewing Company, centuries of brewing expertise at Lexington Brewing and Distilling Company, bourbon-barrel-aged brews from Rooster Brew in Paris, just to mention a few! 10. Lexington has an astounding array of non-chain restaurants. Lexington&apos;s thriving culinary scene is largely the product of close collaborations between local famers and chefs dedicated to creating inventive menus from the freshest local ingredients. 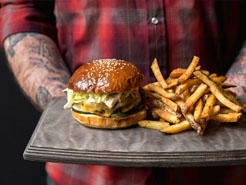 Locally owned restaurants include hip new hotspot Middle Fork Kitchen Bar, recently named one of the top 100 Hottest Restaurants in America by Open Table. Located in the previous home of the James E. Pepper bourbon distillery, the restaurant&apos;s menu features small plates, vegetable-based dishes, homemade spätzle, pork, beef, lamb, chicken or duck entrees. You can check out special bourbon-inspired dinners at Distilled at Gratz Park Inn, where artistic expression meets a farm-to-table focus and elevated Southern cuisine; or savor dishes such as Maine Lobster Salad, Grippo Crusted Rabbit, Porcini Dry Rub Filet and much more. The city&apos;s new Museum Hotel, 21C, is also home to one of Lexington&apos;s trendiest newcomers, the modern and elegant Lockbox. Chef Jonathan Searle&apos;s inventive entrees emphasize high-quality seasonal ingredients, from squid ink macaroni, to cast iron hog chop or chickpea panisse. There are also breakfast favorites like house-made granola and Greek yogurt or veggie-rich egg white frittatas. Twenty-nine new locally owned restaurants opened in 2015, and more will be added in 2016. 11. The New York Times likes Lexington donuts. Lexington hosts an unofficial Donut Trail, featuring a lineup of local bakeries. In 2012, The New York Times called some of more than 60 donut varieties from Doughdaddy&apos;s "shockingly good," praised Spalding&apos;s Bakery dark yeast donuts and explosions of pastry cream, and adored the cinnamon swirl donuts with pecans on top from Magee&apos;s Bakery. 12. Many celebrities--old and new--have Lexington connections. Several famous historic figures have called Lexington home. They include 19th-century politician Henry Clay; Isaac Burns Murphy, an African American jockey who repeatedly won the Kentucky Derby and was inducted into the National Museum of Racing&apos;s Hall of Fame; Adolph Rupp, one of the most successful coaches in college basketball; legendary frontiersman Daniel Boone; and famous Claiborne Farm racehorse Secretariat, winner of the Triple Crown. Modern-day celebrities born in the Lexington area include actors George Clooney, Michael Shannon, Laura Bell Bundy, Josh Hopkins and Farah Fath. Actress Ashley Judd attended the University of Kentucky and remains a dedicated Wildcats fan to this day. 13. Lexington has quirky arts offerings. A growing number of eccentric street murals fill Lexington, many of which are commissioned by PRHBTN and Lex Arts City Gallery. The most recent mural, a larger-than-life masterpiece depicting Louis Armstrong, covers the side of the Lighthouse Ministries Building. Check out the Mural Challenge. 14. The first American performance of Beethoven&apos;s Symphony No. 1 in C major was performed in Lexington. There is evidence that Beethoven&apos;s first symphony was performed in 1817 at the Postlethwait&apos;s Tavern. Music has always played an important role in the cultural life of the city. The oldest annual bluegrass music festival in the region occurs at The Kentucky Horse Park in Lexington. The Festival of the Bluegrass takes place during the first full weekend of June, and celebrates its 43rd anniversary June 9-12, 2016. 15. America&apos;s largest restored Shaker Village is just a short drive from Lexington. Shaker Village of Pleasant Hill is America&apos;s largest private collection of original 19th-century buildings and a National Historic Landmark. The 3,000-acre preserve features native prairie, woodlands, watersheds and diverse wildlife. Visitors can tour preserved Shaker buildings in The Historic Centre, enjoy farm-to-table dining, or choose from a wide variety of daily adventures from outdoor yoga to guided nature hikes. The Historic Farm includes a garden, orchard, livestock and opportunities to pick up organic gardening tips. 16. You can see new Toyotas manufactured here. Toyota&apos;s first wholly owned manufacturing facility in this country, Toyota Motor Manufacturing Kentucky Inc. is also the company&apos;s largest plant outside of Japan. It recently debuted the new Lexus E5 350 line. Free 90-minute plant tours (with reservations) will allow you to watch Camry, Avalon and Venza vehicles manufactured, from the comfort of electric trams. Renowned horse culture and bourbon traditions are only the start of unforgettable adventures, in lovely Lexington, Kentucky.